This is almost a crash course in fundamentals on mobile standards. It does not matter if you are just a common man trying to understand the jargon or a professional who is trying to get a grip of things. This article i hope will help you started off :-) Please leave a comment if you don't understand any topic. I am very happy to clarify. To understand Timeslots and frequencies you can read here!! GSM stands for Global System for Mobile Comm. 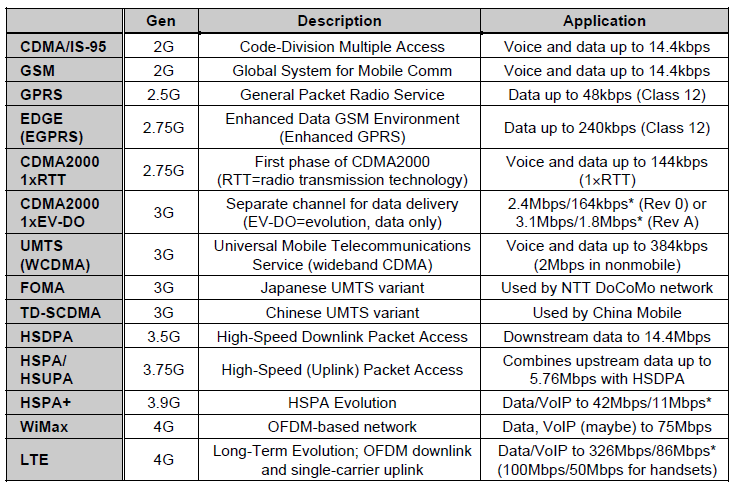 This is the most popular 2G protocol standard in the world. It is by law the only system deployed in Europe and is used in many other locations around the world. As a digital standard, GSM can carry both voice and data, although the maximum data rate per channel is only 14kbps. North America, Korea, and pockets worldwide use another 2G standard based on CDMA technology; this protocol, CDMAOne, was developed by Qualcomm and is also known as IS-95 or, more commonly, CDMA. GSM is based on time-division multiple access (TDMA) technology, in which a single frequency is divided into eight time slots, with each caller using a particular slot. Most GSM networks operate in two frequency bands: 900MHz and 1,800MHz. In North America, however, the allocated frequency bands are 850MHz and 1,900MHz. Thus, to support global roaming, a handset must support all four GSM bands. The frequencies in each band are assigned to either the downlink direction (from the base station to the user) or the uplink direction (from the user to the base station). Each band supports 124 carrier frequencies in each direction (uplink and downlink). GPRS stands for General Packet Radio Service. This is a 2.5G protocol standard which allows a single handset to use up to four slots for the downlink and four for the uplink, thus consuming the entire frequency. Using a more efficient encoding than GSM, GPRS can transmit 20kbps per slot for a maximum of 80kbps in each direction using four slots. A later enhancement, EDGE, increases the data rate to a theoretical maximum of 384kbps, although the most bandwidth supported by any chip vendor or carrier is 240kbps. EDGE stands for Enhanced Data GSM Environment is a 2.75G protocol standard, which increases the bandwidth of each time slot to 48kbps. Baseband processors commonly support either Class 10 or Class 12, which allow a maximum of four slots (192kbps) on the downlink. UMTS stands for Universal Mobile Telecommunications Service which is a 3G standard and is a follow-on to GSM, created by ITU. (Japanese carrier NTT DoCoMo uses a pre-standard version of UMTS known as FOMA.) UMTS uses new spectrum at 2GHz and new air interfaces that can carry more data, and therefore a greater number of digital voice calls, than can 2G technologies. UMTS delivers symmetric data rates as high as 384kbps for handsets. Unlike earlier standards, UMTS supports simultaneous voice and data services (dual-transfer mode). With tremendous growth in cell-phone usage during the 1990s, vendors sought to use new frequency bands and new technologies to increase capacity. The term 3G indicates the generational leap involved in this major change. The first 3G network was deployed by NTT DoCoMo in Tokyo in 2001. Today, 3G is broadly deployed by operators around the world. Most operators, however, have not upgraded their entire networks, so 3G devices must include 2G compatibility to have the widest service area. Qualcomm has continued to develop its own CDMA2000 air interface, thus providing its operators with an upgrade path. The 3G version, known as EV-DO, was first deployed in Korea in 2002. Since then, it has been broadly deployed in North America and other locations. The initial version, called Revision 0 (zero), supports data rates up to 2.4Mbps. Approved by the ITU in 1999 and officially adopted by China in January 2006, TD-SCDMA is a 3G standard deployed primarily by China Mobile, starting in 2008. As the name implies, this air interface combines TDMA and CDMA techniques, but the general characteristics and data rates are similar to those of UMTS. The TDMA aspect of the standard enables use of the same spectrum for both the uplink and downlink, thus providing some flexibility. TD, as the TD-SCDMA standard is sometimes called, provides aggregate data rates of 2Mbps. HSPA stands for High-Speed (Uplink) Packet Access which is a 3.75G standard. This combine both HSDPA and HSUPA as explained in the next oaragrapgh. As with 2.5G technologies, new technologies enhance the data rates of UMTS while maintaining radio compatibility. The first to ship was HSDPA, which was first deployed in late 2005. HSDPA reserves a portion of the UMTS spectrum and converts it into a new high-speed downlink band. This 14.4Mbps band is shared by all users that are actively downloading data; as with any shared medium, actual bandwidth depends on how many users are simultaneously sharing the downlink band. The amount of data that each handset can accept may be limited. HSUPA addresses the uplink. This direction is of concern for handset users wishing to transmit high-resolution photos or video. HSUPA raises uplink speed as high as 5.76Mbps. Initial commercial deployments began in early 2007. By pushing peak data rates to several megabits per second, HSDPA and HSUPA (together called HSPA) can also be used to deliver cellular broadband services. The data bandwidth using these technologies is similar to what older DSL and cable modems deliver. HSPA+ further boosts data rates using two approaches. One uses a higher-order modulation to pack more bits into the signal; the second adds MIMO (multiple input, multiple output) capability, which can double throughput by transmitting two streams at once. To do so, MIMO requires two antennas at the base station and two antennas on the handset. The two approaches can be used separately or can be combined to achieve 42Mbps. The TD-SCDMA standard can be extended to support faster downlink and uplink speeds using the same techniques that are defined in HSPA. The enhanced protocols are referred to as TD-HSDPA and TD-HSPA. Advancing CDMA2000, Qualcomm developed EV-DO Revision A, which boosts data rates as high as 3.1Mbps on the downlink and 1.8Mbps on the uplink. The new EV-DO Revision B supports 14.7Mbps on the downlink and 5.4Mbps on the uplink; these data rates are similar to those of HSPA. Qualcomm sampled the first EV-DO Rev B chips in late 2008. The UMTS camp has developed a 4G technology called Long-Term Evolution (LTE). The specification was completed in January 2008. In December 2009, TeliaSonera deployed the first commercial LTE network in Norway and Sweden. LTE uses a new modulation technique, OFDM (orthogonal frequencydivision multiplexing), and wider (20MHz) channels to deliver a peak data rate of 100Mbps. Optional MIMO support raises the peak rate to 326Mbps in a four-antenna configuration. Because of the space required for multiple antennas, high-end handsets and data cards are likely to use one or two antennas, whereas fixed broadband modems may use four (assuming the carrier supports that mode at the base station). The peak uplink rate is 86Mbps. As a result of these changes, LTE provides about three times the spectral efficiency of HSPA, meaning that an operator can triple the data rate (or the number of voice calls) using the same set of frequencies. Thus, LTE should eventually reduce the cost of data services significantly. Deploying new base stations and bringing down the cost of LTE modems and handsets will require several years, however. Another 4G technology is WiMax. Originally developed by Intel for fixed wireless broadband, WiMax is being used by some mobile service providers. WiMax is defined by the IEEE as 801.16. An industry group, the WiMax Forum, promotes the standard and certifies products for interoperability. Originally conceived as a data standard, WiMax can be used for voice as well. Like LTE, WiMax uses OFDM with channels widths of up to 20MHz. WiMax also supports MIMO. WiMax has a theoretical maximum capacity of 75Mbps, but mobile users will receive no more than 25Mbps—a far lower rate than that provided by LTE. For fixed WiMax, the practical peak rate is 45Mbps. An important difference is that WiMax, unlike LTE, is not optimized for power consumption on the uplink, making it less power efficient for handheld devices. According to the ITU, 4G technologies must deliver data rates of at least 1Gbps. Neither the first generation of LTE nor the initial mobile WiMax deployments meet this criterion, but both are generally considered to be 4G technologies because they use OFDM. As a follow-on to LTE, LTE Advanced is expected to be the first cellular standard to meet the ITU’s 1Gbps goal.